Your life is designed. By people with job titles such as designer, politician or marketeer etc. There is nothing inherently wrong with this, but they have some control over your life. They reduce a person to a buyer, a voter , a user, an set of eyeballs. I want to give insight in their techniques and put them in a broader context. So you can design your life for yourself. To design you must understand the choices you have. What is the material we are working with. Many people have thought about life. We will look at psychology, philosophy, design and religion to get a handle on the subject. Not for their own sake, but always to inform a design choice. "Good game design happens when you view your game from as many perspectives as possible. I refer to these perspectives as lenses , because each one is a way of viewing your design. 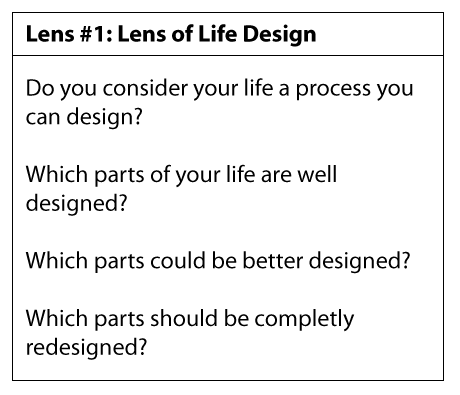 The lenses are small sets of questions you should ask yourself about your design. They are not blueprints or recipes, but tools for examining your design"
I think the same is true for life design. There are many perspectives and it gets better as by asking questions and examining it. I have talked with some people on the subject of life design and life hacking always come up as similar. Life hacking is defined as tricks to make you more efficient and productive via shortcuts, skills or novelty methods. For me there is something inherently suspicious about efficiency productivity for their own sake. I think you end up with products like Soylent. Unlike other foods that prioritize taste and texture Soylent is efficient. A lot is lost in the efficiency for efficiency's sake. Life Design is about the choice and possibility space. “The world is not a wish-granting factory"
So we will not presume that everything is easy or that there is a single mould you should fit.We will examine life from different lenses to not to be perfect, but to see research the possibility space and to see where we do have design choices.